Senior Fantasy Baseball Expert Shawn Childs previews Aaron Judge and the young, talented Bronx Bombers heading into the 2018 Fantasy season! The Yankees smashed their way (241 HRs – 2nd in the majors) back on the baseball map in 2017 thanks to the explosive season by Aaron Judge (52 HRs and 108 RBI). New York has a winning record in each of the last 23 seasons with 19 playoff appearances and five World Series title over this span. They scored 178 more runs than 2016 (680) while allowing 42 fewer runs on the pitching side. Their big move in the offseason was the acquisition of Giancarlo Stanton for 2B Starlin Castro, SP Jorge Guzman, and IF Jose Devers. New York acquired 2B/3B Brandon Drury in mid-February to help upgrade their third base position. DH Matt Holiday, 3B Todd Frazier, Michael Pineda, and SP Jamie Garcia moved on to free agency while resigning C.C. Sabathia. In 2018, the starting lineup will have strength up and down the order while needing to add another option at third base. New York has one of the best bullpens in the game. Their success this year will come down to the starting rotation that pitched better than expected in 2017 (3.72 ERA – 3rd in the AL). Luis Severino pitched like an ace (2.98 ERA and 230 Ks over 193.3). New York needs a rebound and a healthy season from Masahiro Tanaka. The Yankees will be competitive this year while trying to out-homer their AL rivals. New York needs to find a home for the fading Jacoby Ellsbury in the offseason. In a way, 2017 was a slightly better season for Gardner than his success from 2013 to 2015. He set career highs in at bats (594), hits (157), and HRs (21). His K rate (17.9) and walk rate (10.6) fell in line with his career averages. Even with a bounce-back season, Brett struggled vs. lefties (.209 with two HRs and 12 RBI over 148 at bats) while playing well against RH pitching (.283 with 19 HRs and 51 RBI over 446 at bats). He struggled in April (.205 with two HRs and four RBI) with empty production over the last two months of the year (two HRs and 15 RBI over 215 at bats). Most of his counting stats came over a three-month stretch (.275 with 57 runs, 17 HRs, and 44 RBI over 306 at bats). Gardner had a career-high HR/FB rate (13.5). A veteran player with bouts of boring results. His final stats will raise his draft value, but he isn’t a lock to be in the lineup every day without more success against lefties. .260 hitters with neutral value in three other categories (R, HR, and SBs). Gregorius could have been found in the free agent pool in almost all shallow leagues last April. He started the year on the DL with a right shoulder injury. Didi played well as soon as he returned to the starting lineup in late April. Over the first month or so, he hit .307 with three HRs and 18 RBI over 114 at bats). HIs power continued to show growth over the last four months of the season (22 HRs and 69 RBI over 420 at bats). Gregorius had the most success against RH pitching (.295 with 22 HRs and 70 RBI over 390 at bats). HIs K rate (12.3) continues to improve along with his contact batting average (.330). This combination points to a potential jump in batting average; Didi barely takes walks (4.4 percent) while showing more value in this area early in his career. HIs FB rate (43.8) and HR/FB rate (12.1) were career highs in the majors. New York should reward him with a top of the order opportunity in 2018 helping his value in runs. Last year Gregorius hit .321 on the road compared to .251 at home with similar splits in HRs (12 to 13) and RBI (43 to 44). His home park is more favorable to lefties telling me his next step will move him into the upper echelon at short. Possible .300 with 100+ runs, 30+ HRs, and 100+ RBI and some token steals. Stanton set career highs in just about every category in 2017 starting with the most games played (159) in his career. He led the National League in HRs (59), RBI (132), and slugging percentage (.631). Best of all, Giancarlo had a career low K rate (23.6) with continued strength in his walk rate (12.3). Stanton had a massive average hit rate (2.244) with more upside left in his CTBA (.387) based on his major league resume (over .400 in three of his last six seasons). He crushed lefties (.323 with 15 HRs and 38 RBI over 127 at bats) with an excellent BB:K ratio (28:23). As great as his season was, almost half of his production came in July and August (.317 with 30 HRs and 60 RBI over 202 at bats). Even with a huge step forward in power, Giancarlo had his highest GB rate (44.6) in his major league career. He set a career high in his HR/FB rate (34.3), which was just above his elite number set in 2015 (32.1). The change to AL and a better overall lineup can only help his counting categories. Pretty much a 40/120 player going forward with 550 at bats. His speed has a chance to rebound in some way while his batting average is at the mercy of his ability to control his strike zone. After chasing the hot power catcher for years in the high-stakes market, I was left on the sidelines watching Sanchez bash his way to 33 HRs with 90 RBI. He did this in only 471 at bats due to three missed weeks in April with a biceps issue. Most of his power came in June (.307 with nine HRs and 27 RBI over 88 at bats) and August (.287 with 12 HRs and 26 RBI over 108 at bats). Gary showed similar power vs. righties (25 HRs in 362 at bats) and lefties (eight HRs over 109 at bats). HIs K rate (22.9) improved slightly from 2016 (24.9) while his minor league resume (20.0) points to continued growth. He did take a fewer walks (7.6 percent). Sanchez finished with a nice HR/FB rate (25.4), which was well below his high level in 2016 (40.0). Last year his swing path become more balanced resulting in more line drives (21.1 percent). Over eight seasons in the minors, Sanchez hit .277 with 100 HRs, 431 RBI, and 37 SBs in 2,454 at bats. In 2016 and 2017 between the minor and the majors, Gary has 64 HRs over 969 at bats. Middle of order catcher with 30/100 skill set with 500+ at bats. His batting average will be an asset while offering some value in speed. Over five seasons in the minors, Bird hit .283 with 51 HRs, 202 RBI, and three SBs in 1,310 at bats. His K rate (20.9) was much stronger in the minors than his results in the majors (27.3). Greg shows the ability to take a walk with New York in (10.9 percent walk rate – 14.9 in the minors). Over the last six weeks of 2015, he hit .261 with 11 HRs and 31 RBI. His swing hasn’t been good against righties (.218 with 15 HRs and 24RBI in 234 at bats) in the majors with some success vs. LH pitching (.257 with five HRs and 15 RBI in 22 at bats). His power was tied to a huge FB rate (51.7) and a strong HR/FB rate (28.3). Greg missed all of the 2016 with a torn labrum in his right shoulder. In 2017, Bird hit his way up the draft board with a great spring training (.451 over 51 at bats with eight HRs and 15 RBI), but an April ankle injury led to almost five lost months. Over the last five weeks last season, he hit .253 with eight HRs and 25 RBI over 87 at bats while doing a better job controlling his K rate (20.4). His average hit in the majors is in an elite area (2015 – 2.024 and 2017 – 2.214). Very attractive backend power first base options. His skill set points to 30+ HRs with a middle of the order RBI rate (17). Early in his minor league career, Aaron appeared to have top of the order ability due to his high walk rate (14.3) his speed (92 SBs over his first 1,762 at bats). He’s struggled to find a starting job in the majors with injuries also being a factor, but he’s flashed a couple of times with the Yankees (July of 2015 – .346 with four HRs and 16 RBI over 78 at bats and the first three months of 2017 – .290 with 40 runs, ten HRs, 37 RBI, and seven SBs). His success early last year would project well over 550 at bats plus he showed a winning approach at the plate over this span (15.3 percent walk rate and 17.4 percent K rate). Both of these number are much stronger than his early days in the majors with the Twins (K rate – 26.0 and walk rate – 11.2). Aaron handled himself well against lefties (.312 with five HRs and 19 RBI over 109 at bats) while offering solid production against RB pitching (39 runs, ten HRs, and 33 RBI) when considering his low at bats (192). In 2017, Hicks spent two long stints on the DL (Achilles and oblique issues). Top of the order bat if he repeats his higher CTBA (.342). His foundation skills have high upside in counting stats, but the New York factor could lead to him being overpriced in the high stakes market. With 500 at bats, Aaron will offer a slight drag in batting average with 80+ runs, 25+ HR, 65+ RBI, and 15+ SBs. Over four seasons in the minors, Torres hit .282 with 23 HRs, 197 RBI, and 60 SBs over 1,349 at bats. Last season he had TJ surgery on his left elbow. It was his non-throwing arm, which will help speed up his recovery time. With New York clearing the second base job, Gleyber is the favorite to winning the starting job in spring training. His K rate (20.3) in the minors is about league average while showing the ability to take walks (10.5 percent). Torres won’t offer an edge in speed, but he’ll chip in with some steals. He needs to improve his jump to have a higher success rate (60 percent in the minors). Over the last two seasons, his average hit improved in each year pointing to 20+ HRs early in his career. His bat and overall game will make a huge step forward when he adds more bulk and strength. It will take him a couple of years to push his way to the top of the Yankees’ batting order without the help of an injury or two. Upside flier at middle infield. I expect his batting average to be over the league average with a 15/10 type skill set in 2018. His runs and RBI shouldn’t offer an edge out of the gate. Drury enters 2018 with some cloudiness with his expected role and future upside. His approach (K rate – 21.5 and walk rate – 5.8) won’t give him a top of the order opportunity. Brandon has a strong enough AVH (1.672) to produce 20+ HRs especially if he trades some of his doubles (37) for home runs. Drury played well over the first three months (.287 with eight HRs and 38 RBI over 254 at-bats). The Diamondbacks didn’t give him the same opportunity after the All-Star break (.238 with five HRs and 23 RBI over 168 at-bats). His swing had similar value against RH (.266 BAA) and LH (.271 BAA) pitching. Brandon has a groundball swing (48.8 percent) with a slight regression in his HR/FB rate (12.9). His minor league resume (.285 with 60 HRs and 363 RBI over 2,501 at-bats) gives him a chance of being a .300 hitter with a 20/80 skill set with a full season of playing time. Possible bench option if you structure your roster properly to cover his lack of speed. Update: The trade to New York should be a winning opportunity for Drury as far as at-bats, but he is going to hit at the bottom on the batting order. In early January, Andujar looks to be the top choice to start at third base for New York. I expect the Yankees to sign another option, which will leave Miguel competing for a bench role out of spring training. He had his best season of his career between AA and AAA in 2017 (.315 with 16 HRs, 82 RBI, and five SBs over 480 at bats) leading to late season call-up to the majors (4-for-7 with four RBI). Andujar hit .274 over his six seasons in the minors with 51 HRs, 336 RBI, and 30 SBs over 2,271 at bats. His walk rate (6.1) is below league average with strength in his K rate (15.1). Miguel still needs work in his AVH (1.583) even with slight growth in each season in his minor league career. Last season he had a jump in his CTBA (.369), which was the reason for his step up in batting average. Not quite ready to be a factor in the majors. He needs a little more thump in his swing to man the hot corner in New York every day. Future 20/80 type player with a neutral to positive batting average. Update: The addition of Brandon Drury pushes Andujar to a bench role or possibly another trip back to the minors. Frazier was the fifth overall draft pick by the Indians in 2013. Over his five seasons in the minors, Clint hit .272 with 62 HRs, 247 RBI, and 52 SBs over 1883 at bats. He has a high K rate (24.8) with upside in his walk rate (10.4). Last season Frazier started to add more length to his hits (1.843 at AAA and 1.935 in the majors) putting in an area with 30+ HRs is achievable with a full time starting job in New York. As an injury cover in the majors in July, Clint hit .270 with four HRs and 17 RBI over 89 at bats. His BB:K ratio (4:26) and K rate (27.7) showed weakness while struggling with his Ks (17 over 45 at bats > 35.4 percent K rate) over limited playing time late in the season. He suffered an oblique issue in August led to about a month on the DL. New clear path to a starting job without the Yankees moving on from Brett Gardner. Nice balanced skill set with injury cover value if given an opportunity to start. His batting can’t improve in the majors without improvement in his K rate or a rise in his CTBA (which is trending down with each step up in the minors. The Yankees will surely move Ellsbury before the start of the 2018 season, but they won’t avoid paying the last three years of his contract ($63+ million). Last year Jacoby had strength in his run rate (48) with a slight uptick in his AVH (1.521) while his CTBA (.321) fell in line with his last three seasons. He had a career-high walk rate (10.0) with some regression in his K rate (15.4). Ellsbury missed about a month of the season with a concussion. 2017 was a lost season for Jacoby with New York finding more options in the outfield to put him on the bench. I don’t believe he’s worthless to a Fantasy team and a change of scenery should treat him well. Only a .270 at this point of his career with only low double-digit power and 30 stolen base upside with 550 at bats. He’ll find a home and he may surprise in 2018. Austin Romine (C) – Over 563 at bats in the majors, Romine hit .220 with seven HRs and 58 RBI. He’s a career .273 hitter in the minors with 57 HRs, 340 RBI, and 19 SBs in 2,425 at bats. Austin spent part of the last five seasons at AAA (.251 with 17 HRs and 96 RBI in 741 at bats). Not enough upside to earn a starting job while not being a lock to win the backup catching job. Tyler Austin (1B) – New York may allow one of their outfield options to play some first base in 2018, which would hurt Austin’s chance of making the roster. Over eight season in the minors, Tyler .287 with 71 HRs, 349 RBI, and 65 SBs. He struggled with strikeouts so far in the majors (53 in 123 at bats > 39.8 percent). With New York in 2016 and 2017, Austin hit .236 with seven HRs and 20 RBI. Not a bad backup plan if Greg Bird has another injury, but he needs to make better contact to keep the front office from searching for a better option. Ronald Torreyes (IF) – In his two seasons with Yankees, Torreyes hit .282 with four HRs, 49 RBI, and four SBs over 476 at bats. His K rate (12.5) is an asset while barely taking any walks (3.3 percent). Ronald hit .298 in the minors with 22 HRs, 253 RBI, and 72 SBs over 2,301 at bats. He’s expected to be the top infield option off the bench for New York in 2018. In 2016, I had Severino as my breakout pitcher. Even with a great write-up in 2017 (Here’s my last two lines from his profile: Complete gift in the early draft season [ADP of 409 in 15 team leagues]. Potential SP3 with a chance at a sub 3.50 ERA and 175 Ks), I didn’t own him enough last season. I didn’t commit to him on draft day, which was a huge mistake. I try to finesse in too many leagues. In the end. Luis found his command (2.4 percent walk rate) leading to a step forward in his K rate (10.7). His early minor league resume supported both results. Over five seasons in the minors, Severino went 31-12 with a 2.51 ERA and 403 Ks over 401.1 innings. Last season batters only hit .208 against him with strength vs. both righties (.198) and lefties (.221). At great as he was in 2017, Luis was electric in the heat of the playoff battle in September (3-0 with a 2.10 ERA over 30 innings with only six walks and 30 Ks). His game wasn’t quite ready to make an impact in the playoffs over four starts (5.63 ERA over 16 innings with eight walks and 12 Ks). His AFB (97.8) was special while throwing a dominating slider (.181 BAA) and a much-improved changeup (.171 BAA). His new confidence led to a step up in his first strike rate (65.1). Great career ahead of him with clinching 7th game of the World Series not far away. 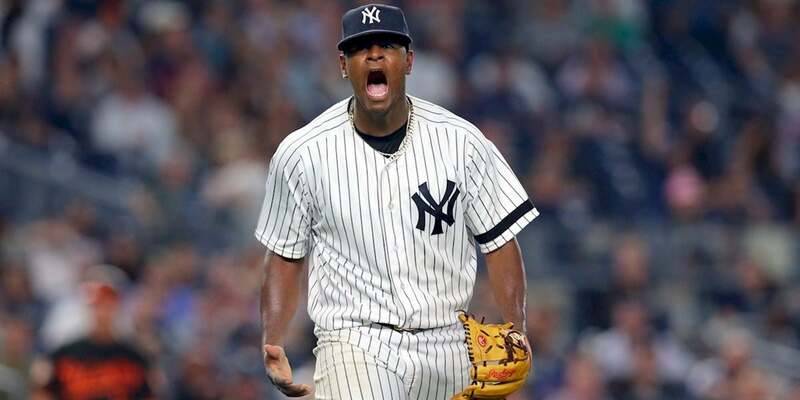 Severino should be a workhorse type ace going forward with some regression in his K rate expected with more volume of innings. 2018 is setting up for 20+ wins with a sub 2.75 ERA and 250 Ks with 225 innings pitched. Enjoy one hell of a ride. Tanaka was a big mover in the high stakes market in late March after allowing one run over 23.2 innings in spring training with 28 Ks. It only took one start (seven runs over 2.2 innings) for Fantasy owners to have buyer’s remorse. After 14 starts, Masahiro had a 6.34 ERA and 1.487 WHIP over 76.2 innings. The biggest part of his failure over this period came from 21 HRs allowed. His arm surely looked hurt as the calendar was approaching July. Tanaka rebounded in a big way over his next 12 starts (8-4 with a 2.77 ERA and 82 Ks over 78 innings). His season ended with a four-game battle between disaster (14 runs, 17 baserunners, and four HRs over 9.2 innings) and supremacy (two runs over 14 innings with 23 Ks). In the end, his ERA (4.74) and WHIP (1.239) finished well below expectations while allowing massive home runs (35 – 1.8 per nine innings). Masahiro walked a few more batters (2.1 per nine) with a career-high K rate (9.8). HIs AFB (93.1) was the best in his career in the majors while also showing more zip on his secondary pitches. Batters struggled to hit his slider (.200 BAA) and split-finger fastball (.191 BAA), but he did allow 19 of his HRs on those pitches. His four-seam fastball (.318 BAA) and sinker (.351 BAA) both were easier to hit. Torn between a TJ surgery and potentially his best season of his career. Love his command, improved K rate, potential for run support, and bullpen behind him. It really comes down to staying healthy. He’s never pitched over 200 innings, so can’t be drafted as an ace. Ideally, a SP3 with upside which will help absorb his downside if he did indeed get hurt. The good: 17 wins with a sub 3.00 ERA and a run at 200 Ks. The bad: a waste of an early draft selection (ADP of about 111 in the early draft season). The Red Sox in me will stay clear of him in 2018. After a cloudy and short 2016, Gray entered last year with questions about his health (lat/back). He missed the month of April while pitching poorly over his first ten starts (4.84 ERA and 1.42 WHIP). Sonny found his rhythm over his next six starts (1.37 ERA, 0.814 WHIP, and 36 Ks over 39.1 innings) leading to a trade to the Yankees. In New York, he went 4-7 with a 3.72 ERA and 1.255 WHIP. HIs AFB (93.8) was below his best years in Oakland (94.3). His best pitch continues to be his slider (.137 BAA). Batters struggled against his four-seam fastball (.226 BAA) and sinker (.248 BAA). Gray had almost equal success vs. RH (.231) and LH (.221) batters. He has a career 3.45 ERA with a rising K rate (8.5) with a great finish to 2017 over 17 starts (2.84 ERA over 104.2 innings with 95 Ks). High groundball pitcher (52.8 percent in 2017) with a chance to win 15+ wins with edge in ERA, WHIP, and Ks with some growth in walk rate. Sabathia has a fading K rate (7.3) and walk rate (3.0), but he battled his way to 14 wins in 2017 with 3.69 ERA. After three good games to start the year (three runs over 18.1 innings with 11 Ks), C.C. pitched his way to the waiver wire over his next four starts (9.58 ERA, 1.935 WHIP, and five Ks over 20.2 innings). Over his next six starts, Sabathia was an elite arm (5-1 with 0.99 ERA and 35 Ks over 36.1 innings). A hamstring issue cost him about three weeks over the second half of June plus a knee issue in August led to another ten days on the DL. Over the last three months of the season, he went 9-5 with a 3.93 ERA and 58 Ks over 73.1 innings. C.C. had reasonable success against righties (.244) and lefties (.253). His AFB (90.9) was slightly better than his last three years, but he only threw it about 23.5 percent of the time. He threw a nice slider (.175 BAA) while also relies in his changeup (.235 BAA) and cutter (.258 BAA). New York re-signed him to a one-year contract in the offseason. He needs 13 wins to reach 250 in his career. Backend inning eater who has a chance to help a backend of a Fantasy pitching staff. Lefties tend to have nine lives, so Sabathia is worth a look in 2018 with a sub 4.00 ERA and 150 Ks being his new skill set. Over four seasons in the minors, Montgomery went 25-14 with a 2.57 ERA and 297 Ks over 300.2 innings highlight by his success in 2016 at AA and AAA (14-5 with a 2.13 ERA and 134 Ks over 139.1 innings). New York give him a starting job in early April. Jordan struggled over his first seven starts (4.81 ERA and 37 Ks over 39.1 innings). Montgomery threw the ball at a high level over his last 22 starts (7-4 with 3.57 ERA, 1.172 WHIP, and 107 Ks over 116 innings). His walk rate (3.0) was above his minor league resume (2.6) while posting a solid K rate (8.3) to start his career. Jordan threw three very good secondary pitches (curveball – .172 BAA, slider – .184 BAA, and changeup – .205 BAA). His average fastball came in at 92.1 with better results with his four-seamer (.259 BAA) than his sinker (.396 BAA). The strength of his secondary stuff plus his possible growth in his command should lead to 15+ wins with 150+ Ks and a sub 3.50 ERA. Green struggled at AA in 2015 (5-14 with a 3.93 ERA with 137 Ks in 148.2 innings). His arm made a huge step forward at AAA in 2016 (1.52 ERA with 100 Ks in 94.2 innings), but he struggled in the majors (4.73 ERA with 12 HRs allowed over 45.2 innings) due to a right elbow injury (UCL strain). His 2017 started in the minors with poor results as a starter at AAA (4.73 ERA and 1.612 WHIP with 33 Ks over 26.2 innings). New York called him up in early May to be a long man out of the bullpen. Over his first nine games covering 20 innings, he allowed ten hits with 24 Ks leading to a 2.70 ERA. From that point on, Chad was one of the best relievers in baseball (1.47 ERA over 49.0 innings with 79 Ks). On the year, batters only hit .147 against him with elite success against righties (.162 BAA) and lefties (.120 BAA). Even with his high level of success, Green did allow a huge number of line drives (27.1 percent) while pitching up in the strike zone (46.5 percent fly ball rate). This was a change in approach to get batters out. His AFB (96.0) gained value in the pen with his best two pitches being a slider (.200 BAA) and cutter (.235) plus batters couldn’t touch his four-seam fastball (.121 BAA). In addition, his first pitch strike rate (66.0) moved to a much stronger area. Over five seasons in the minors, Chad had 3.16 ERA with 416 Ks over 424.2 innings. Last year with the Yankees, 91 percent of his pitches came from his four-seam fastball and slider suggesting to me that his lack of third pitch may be a negative early in his career in the starting rotation. His explosiveness as reliever would be more attractive to me, but he’s a long way away for the 9th inning. With more innings pitched in the starting rotation, his elbow issue may flare up. Player to follow this spring who has the tools to help a Fantasy team in some fashion in 2018. Adams will be in the majors in 2018. He started last year with six strong starts at AA (4-0 with 1.03 ERA and 32 Ks over 35 innings) with continued success at AAA (11-5 with 2.89 ERA and 103 Ks over 115.1 innings). Over 2+ seasons in the minors, Chance went 31-7 with a 2.33 ERA and 324 Ks over 313 innings. His walk rate (3.5) did take a slight step back at AAA as well as his K rate (8.1). These number should grow with more experience in the majors. He relies on a high 90s fastball and plus slider. His changeup is developing, and it will be the key to development in the majors. I expect him to be in the majors at some point, but he’ll need an injury to earn a starting role. I’d prefer Adams as the 6th starter over Chad Green. Must follow with high upside in the near future. Chapman threw the ball great over his first 11.1 innings in 2017 (0.79 ERA with 18 Ks and seven SVs, but a shoulder issue in early May led to two bad outings (four runs and eight baserunners over 1.1 innings) and a five-week DL stint. He pitched his way out of the closer role over the next two months (4.56 ERA) when he allowed eight runs and 13 baserunners over seven innings over a seven-game stretch in August. Aroldis found his way in September (no runs over 12 innings with 17 Ks and six successful save conversions). On the year, Chapman had the lowest K rate (12.3) of his career while remaining in an elite area while his walk rate (3.6) regressed from 2016 (2.8). His AFB (100.2) is one of the best in the game with batters hitting .191 against it. A slider remains his number two pitch (.234 BAA). Special arm with elite value in Ks. New York will score plenty of runs again in 2018, which will limit his save chances. Over six seasons as closer, Aroldis doesn’t have a season with more than 38 saves. Top five closing option again this season while offering an edge in four categories. Robertson had his best season since 2011, but Fantasy owners weren’t rewarded due to the trade to the Yankees and his lack of saves (14). David did win nine games in relief with a rebound in his K rate (12.9). He still walks too many batters (3.0 per nine innings), but it was a much better number than 2016 (4.6). Batters only hit .148 against him with almost equal success (RH – .154 BAA and LH – .140 BAA). His best value came in New York (5-0 with a 1.03 ERA and 51 Ks over 35 innings). David lost some life on his cutter (92.0), which is his best pitch, but batters only hit .206 against it. He throws one of the better curveballs in the game (.090 BAA). With 132 saves on his career resume, Robertson should be next in line for saves in New York. Nice steady arm with chance to pick up some nice vulture wins in 2018. Betances forgot how to throw strike one in 2017 (51.5 percent) leading to a sharp decline in his walk rate (6.6 – 4.1 in his career) with disaster downside on his bad days. Over his first 24 games covering 22.2 innings, Dellin allowed only in one run with 43 Ks and six saves. He sure looked closer-worthy with Aroldis Chapman on the DL. Over a seven-game stretch from late June through early July, he allowed nine runs, 17 baserunners, and 12 walks over 4.2 innings leaving Fantasy owners scratching their heads to what happened to his game. Betances rebound over the next seven weeks (0.83 ERA over 21.2 innings with 33 Ks) before losing his way again in early September (9.95 ERA over 6.1 innings). He still dominated both righties (.159 BAA) and lefties (.122 BAA) while featuring a special fastball (98.3). Batters only hit .114 against his curveball. In 2016, he struggled to hold baserunners at first base, which led to 21 successful steals in 21 attempts. Last year Dellin allowed only six steals in nine attempts. Great arm, but he needs to iron out his mechanics to have value in the 9th inning. 100+ K reliever with some value in saves.